Cox Communications has been a SundaySky customer for five years, running personalized video ad programs through traditional video publisher channels. 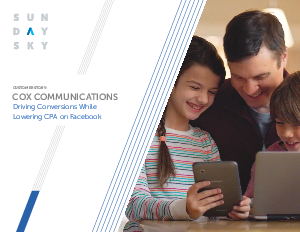 At the end of 2016, Cox Communications expanded that program to Facebook to see if greater levels of personalization and performance could be achieved by combining the dynamic capabilities of SmartVideo technology with the reach of the Facebook ads platform. The program targets recent Cox website visitors on Facebook and delivers them a relevant video ad with offers related to products and services they had viewed on Cox.com. The program leverages SundaySky’s SmartVideo platform to achieve Cox’s online revenue goals of maximizing the number of revenue-generating orders on its website while also lowering the cost per acquisition (CPA) as the program optimizes.